Green Metallic Bee, Ailanthus Webworm Moth and Hoverfly. You've probably noticed that there are many small and colorful flying critters visiting your flowers during the growing season. Nature has provided us with an array of pollinating insects~ including wasps, moths, butterflies and bees. I appreciate all the pollinators at Clay and Limestone, but, my favorite are the bees. Occasionally honeybees visit, but, the bees that live in my garden are non-honey producing, social and solitary nest building bees. Way back in the early 90s they started referring to non-honey producing bees as pollen bees. Nowadays, we call them native bees! Pollen bees/native bees are valued for the role in pollinating our wildflowers and crops. 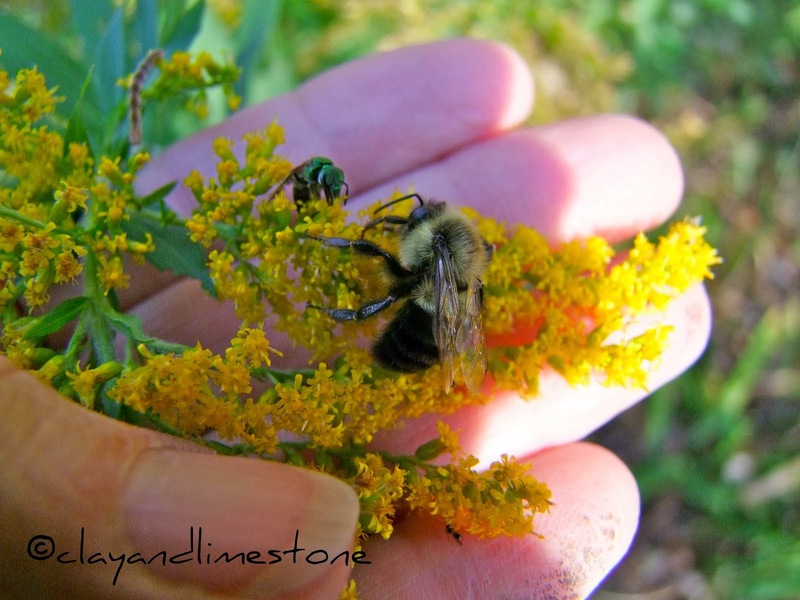 The Bumble Bee and the Green Metallic Bee are two of the many native bees that reside at Clay and Limestone. Both bees forage our gardens for nectar and pollen to feed themselves and their offspring. The Green Metallic Bees are solitary bees and care for their brood cells by them selves. Although, they often live in close proximity to other female bees, sharing entrance tunnels to their separate apartments. The Bumbles are social bees and live in larger colonies with many female bees caring for the Mother bee's off-spring. The tiny, but, beautiful Metallic Green Bees captured my interest and attention when I saw them swarming all over a late blooming agastache several years ago. Their color was dazzling. They flock to the native ex-asters, agastaches, goldenrods and other late blooming flowers. They are generalists and have never met flower pollen they didn't like. On the whole, generalist bees, like the Green Metallic Bee are more resilient. They aren't dependent upon a particular flower's pollen to survive. Even a degraded habitat with weeds and non native plants would be fine for them. Imagine the haven a well planned pollinator garden would be for generalist and specialist bees. In the United States, honey bees, bumble bees, and approximately 4000 species of solitary bees pollinate agricultural crops, our garden plants, and plants of lawn, meadow and forest. How we garden and the habitat we create can contribute to the our native bee's health and survival in an often hostile world. "bees are “keystone organisms” in most terrestrial ecosystems. That is all of us land dwellers! Bees are essential for maintaining the integrity, productivity and sustainability of many types of ecosystems: the forest understory, pastures, fields, meadows, roadsides, many agricultural crops, fruit orchards, and backyard vegetable and flower gardens. That is all that we admire and love. Without bees, many flowering plants would eventually become extinct. Can you think of any you want to say so long to? Here's what we gardeners can do for native bees? Provide nesting spots~Soft and exposed soil, decaying logs, nesting boxes, research what they need. This is the second in a series on native bees and other pollinators in our gardens. Other posts about bees you might enjoy are also listed. *The Green Metallic Bee is also known as a Sweat Bee. And, yes, they are attracted to the gardener's salty sweat and, yes, they can sting. In case you wondered: their sting is rated 1.0 on the Schmidt Sting Pain Index~making it almost painless! (1.0= Light, ephemeral, almost fruity. A tiny spark has singed a single hair on your arm.) But, pain is subjective~be careful out there. If you are allergic to bee stings even this tiny bite can be dangerous. I love this post Gail. I don't have Green Metallic Bee in my garden or if I do, I've not seen it. It is fun to see your photos with multiply insects on each flower. You have opened my eyes. I did not know the Green Metallic Bee was in fact the same as sweat bees that tortured my brothers standing in the clover covered outfield at base ball games. He still believes it was the distracting bee's fault for loosing the final game of the season. Aw, noid is so cute!! I could go for seeing some of these pollinators and their food right now. I can't hardly wait for this time of year. Your post and photos are so beautiful ...too bad our eyes can't see our pollinators like your camera can! The green metallic bees come here, too - one of their favorites seems to be Garlic Chives. Gail, could you take a quick look at this photo and tell me if you think your NOID is also my NOID? this is a suberb post. As a former beekeeper (I had to stop because of a bad allergy to bee stings that developed) I am very aware that not only do honeybees pollinate plants, so do many other types of bees - and other insects and creature. I try to educate people about bees, and have them understand that bees are not out to sting you for no reason. Thrashing your arms does not good. Also, those 'bees' that hang around picnic sites are usually yellow jackets, but even they have their place in the world. Annie, It does look like mine. I'll spend some time over at the bug id sites and see if I can get the name for us. gail not only are the eyes going, but, the hearing, too. I didn't know metallic green bees stung. They've never bothered me, but then I've never tried to put my hand that close to them. I'm amazed at how you got that shot with your hand & the bees. Thanks, Gail! Hover fly is a better description than Syrphid. One of the other photos in that BugGuide set looks even closer to what I remember seeing as I followed the little redhead around. Ocyptamus/Syrphid Fly. I'm enjoying this series Gail. Like you, I could stare at all the pollinators that buzz around the flowers in the garden for hours. The green bees are eye-catching (and often hard to photograph!). It seems the bumble bees are now also in decline, although perhaps not yet to the same extent as honeybees, but some recent studies have shown that viruses can pass between the two via pollen. Makes me that much more determined to do whatever we can to help support healthy bee populations in our gardens. Gail, this is a great post as is the others in the series. We have a woman bee keeper in our area who regularly speaks to our Master Gardener group on bee health and bee decline. She is extremely knowledgeable in her field and I may post sometime on her recent findings. It is wonderful of you to post all the information to help gardeners keep their native bees happy and healthy. Very interesting post Gail. You are certainly the champion of the bees. Your photos are incredible... great resource for making those pesky ID's. Beautiful captures, Gail!!! Great post! Wonderful photos...I'm in awe! And what a great resource for bee lovers. Dear Gail, Your stunning post is so uplifting to this northern gardener longing for light and warmth. Your photos are wonderful in not only their intense beauty but in how you inspire others to think of our beloved bees! It will not be too long for you now. Nice Photography and include a natural resources. What a bright and colorful post, Gail! Your photos alone should be enough to persuade anyone of the importance of these pollinators. I thought I knew quite a bit about bees, but once again I've learned something new here, and now I also know the name of the webworm moth that I saw so often in my own garden last year. Looking forward to seeing the pollinators return soon! Truly the workhorses of any garden...nice post Gail...I see most of these around here too. My husband calls the Mexican Bush Sage a bee magnet. And it's so easy to propagate, do you have one, do you want one? This is my first visit to your blog and I find it very informative. I love bees too (just wrote a save-the-bees rant last week). Green metallic bees frequent my garden in Illinois, as well. I also get quite a few honey bees (and all kinds of other pollinators). I'll make sure to read your other bee posts. Gail, another wonderful bee post. Your photos are fantastic. I'll have to remember to look at them again in summer when I'm trying to identify insects in my yard. 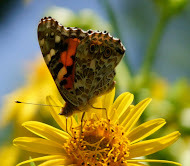 I just love all your pollinator photos - especially the first one. I always wonder what they say to each other back in the nest, "Honey, you'll never guess who I saw on the coneflower today..."
Still dreaming of spring in snowy PA. In the meantime, I'm quilting. All these pollinators. It makes me think of warm summer days and I can hardly wait for them! What an absolutely stunning group of photos. The first one took my breath away and I kept forgetting to read the text as I marveled at these images. Thanks for such an information packed post illustrated with great photographs. Our native insects need all the help they can get. You might be interested in the information about native cultivars and hybrids provided by Doug Tallamy in my post on new native plants for 2011. Have never been observing the bees this close, the green metallic ones are awesome. Great macro photos! I know this is primarily about bees, but thank you for IDing the Ailanthus Webworm. I have taken many pictures of flowers with this creature in them and have been unable to offer a name. Now I know. I just love the green bees! They are scarce in my tiny urban garden, even though I plant with bees in mind. to guess online football coach out to football are rallied around her.